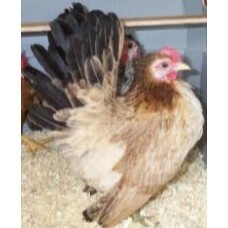 These bantams are classed as Miniature by most people as these are the smallest bantam it is possible to breed. The birds originated from Malaysia and some people think they should be kept warm in the winter. We have ours in a warm workshop during the winter and outside during the spring and summer. These lovely birds with the upright tails are very good Mothers when allowed to bring up a brood of chicks. They are also very good at going broody on any egg when the mood takes them. The hens lay a good amount of small eggs, I estimate about 180- 200 in a year, spread across all the seasons by laying a clutch then stopping for a few days then starting again.